Traditional Patatas Bravas are given a Southern twist by using sweet potatoes and topped with bravas sauce and a ranch aioli. 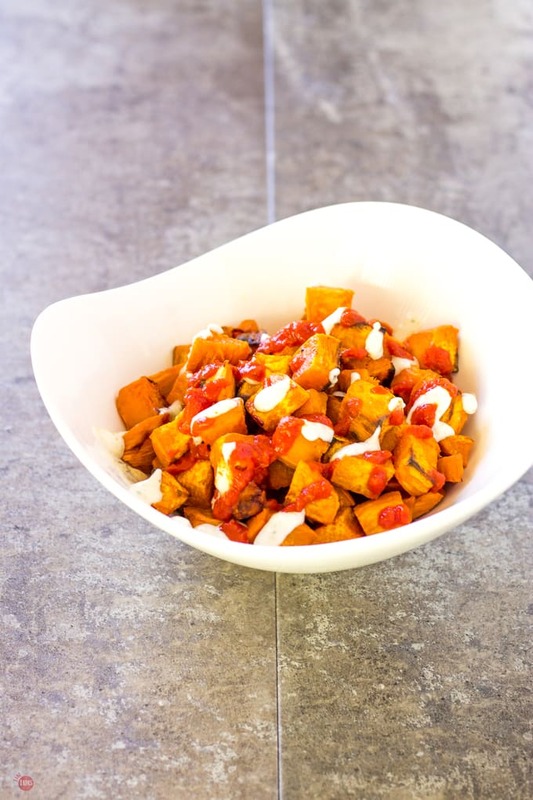 Sweet Potato Patatas Bravas makes a tasty tapas dish! 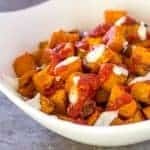 Forget the French Fries, let me introduce you to patatas bravas, or my Southern version of the traditional tapas, Sweet Potato Patatas Bravas. Potatoes are always a welcome sight on my plate but sweet potatoes were not always so. It wasn’t until I went Paleo a few years ago (I admit that I am currently doing a 30/70 version that includes cocktails:) that I started liking sweet potatoes. Now I don’t eat the usual sweet potato toppings like honey butter, cinnamon, and even marshmallows, but prefer a spicier approach to tame the sweetness. I have a psychological aversion to potatoes being sweet. Savory ingredients will always seem savory to me so sweet ingredients that are used in a savory situation need a little coaxing. The easiest way to do that is with some spice! I have never been to Spain but it is on my bucket list. Living vicariously through my blog friends that have actually traveled there, I take inspiration from them for my recipes. Even my summer tapas recipes that I am spinning. 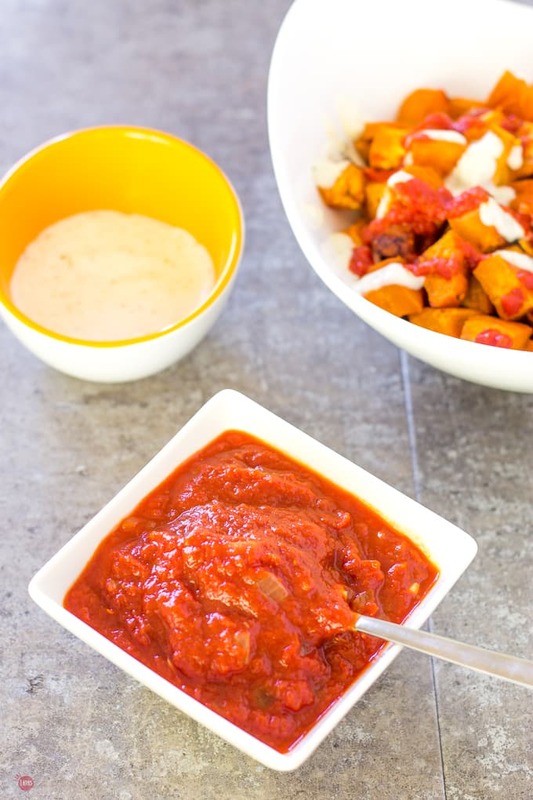 This patatas bravas recipe is inspired by my buddy Meghan over at Fox and Briar. I just added a few Southern substitutions to it to make my version into Sweet Potato Patatas Bravas. Thank goodness this is one of the “heartier” tapas recipes as I need something to soak up the wine I usually drink while eating tapas. 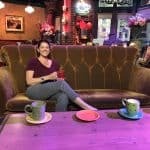 If you are new to the series, check out my post on what Tapas actually is and how I am eating it here in America, since I can’t travel to Spain yet. Also, check out my Pan Con Tomate and my Kalimotxo Cocktail to get you started on your tapas journey! Traditional Patatas Bravas calls for parboiling the potatoes, patting them dry, and then frying them. I don’t have time for that nor do I want to dirty up extra pots with boiling and frying. I plan to use a single baking sheet to roast my sweet potatoes exactly to my liking. You may think these are just roasted potatoes, or in the traditional patatas bravas fried potatoes, but it is really the sauces that make this tapas dish. A smoky “Bravas” sauce or salsa brava is what brings life to the dish. 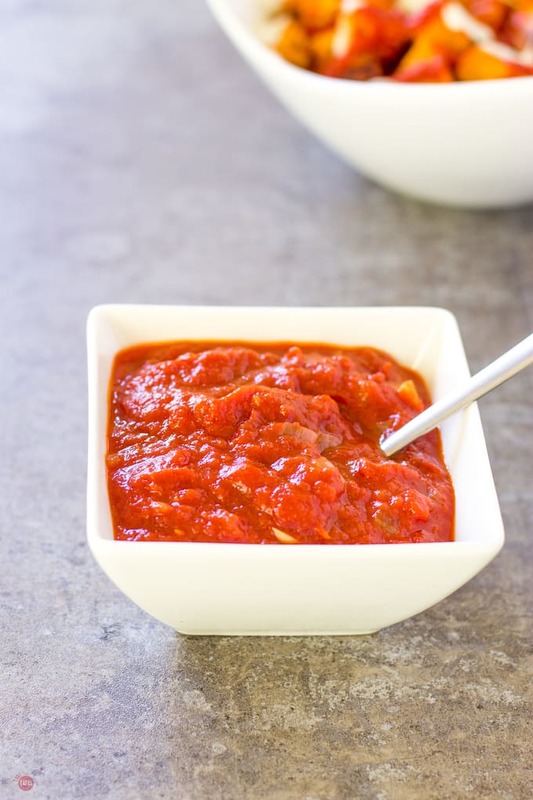 A spicy, smoky blend of tomatoes, onions, and garlic that differs wildly region to region! Some use vinegar, some not, some also leave out other ingredients such as onion or garlic. My version of salsa brava doesn’t use vinegar as I think the tomatoes acidic enough but does include all that yummy garlic and onion. And, of course, the most important ingredient, smoked paprika! A light drizzle of aioli also completes the traditional patatas bravas dish but it wouldn’t have a Southern spin on it if I didn’t change something. I know I use sweet potatoes over regular potatoes already but a “Ranchy” addition will do the trick too. Toss your diced sweet potato in 1 tablespoon olive oil. Mix your mayonnaise, crushed garlic clove, and lemon juice. Add the Ranch Dip Mix. Start making the bravas sauce by combining 2 tablespoons olive oil and the onion in a sauce pan. Cook the onion for a few minutes or until it starts to get translucent. Add the garlic and canned tomatoes. Cook for 5 minutes to get the flavors mixing. Add the tomato paste, cayenne pepper, and smoked paprika. Place your potatoes in the oven and roast them for 15 minutes or until they are slightly soft. When they are slightly tender, turn up the oven to broil. Broil for a few minutes to get the potatoes crispy. Remove the potatoes from the oven and cool for a few minutes. Take the potatoes from the baking sheet and place in a serving bowl. Remove the bravas sauce from the stove. Drizzle bravas sauce over the potatoes. Drizzle the potatoes and bravas sauce with the Ranch aioli. Muy Bien! 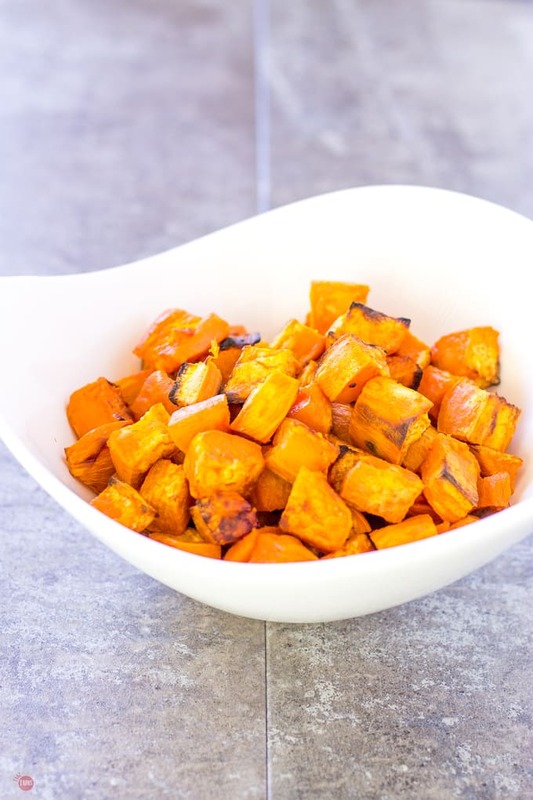 Substituting Sweet Potatoes is a fabulous idea! Cant wait to try these. This is interesting. I am intrigued with your choice of “ranchy” addition. 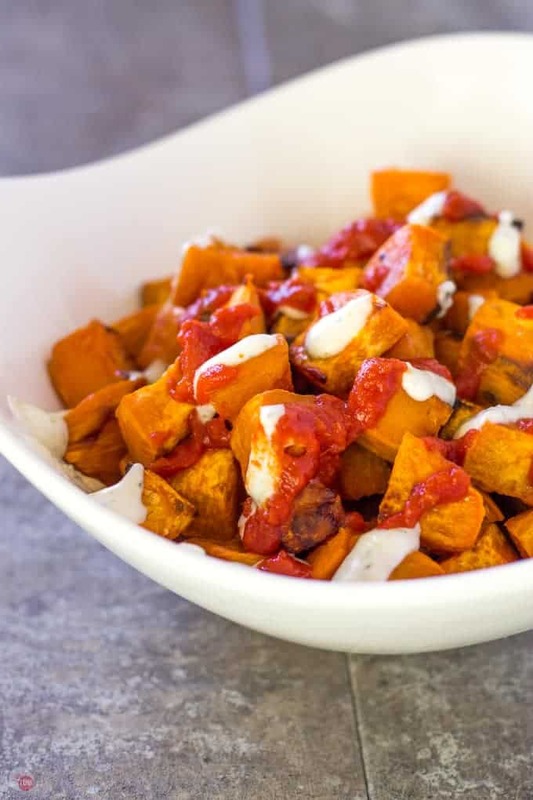 Will definitely try this sweet potato patatas bravas. Thank you for sharing this recipe.